Joseph, L. 2000. Beginning an end to 63 years of uncertainty: the Neotropical parakeets Pyrrhura picta and P. leucotis comprise more than two species. Proc. Acad. Nat. Sci. Phil. 150:279–292. Joseph, L. 2002. 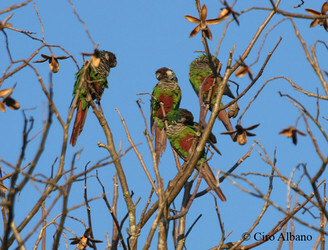 Geographical variation, taxonomy and distribution of some Amazonian Pyrrhura parakeets. Ornitologia Neotropical 13:337-363. Joseph, L. and D. Stockwell. 2002. Climatic modeling of the distribution of some Pyrrhura parakeets of Northwestern South America with notes on their systematics and special reference to Pyrrhura caeruleiceps Todd, 1947. Ornitologia Neotropical 13:1–8. Ribas, C. C., L. Joseph, and C. Y. Miyaki. 2006. Molecular systematics and patterns of diversification in Pyrrhura (Psittacidae), with special reference to the Picta-Leucotis complex. Auk 123:660-680. Local: Serra de Baturité - Ceará. Page: Tree of Life Pyrrhura. The TEXT of this page is licensed under the Creative Commons Attribution-NonCommercial License - Version 3.0. Note that images and other media featured on this page are each governed by their own license, and they may or may not be available for reuse. Click on an image or a media link to access the media data window, which provides the relevant licensing information. For the general terms and conditions of ToL material reuse and redistribution, please see the Tree of Life Copyright Policies.